Apple has started rolling out the iOS 11.1.1 update for iPhones and iPads users. 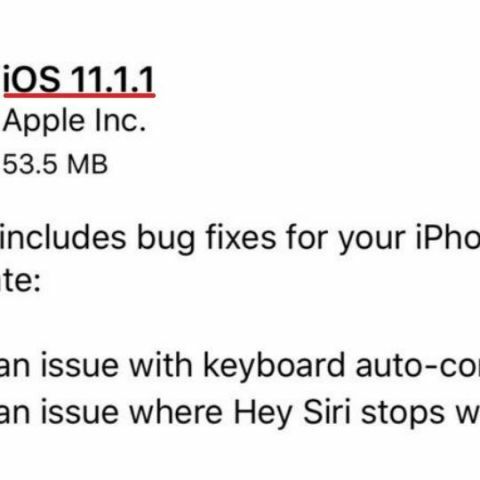 It fixes a pesky autocorrect bug and the “Hey Siri” command not working for some users on their devices. The patch consists of only the two above mentioned bug fixes. The autocorrect issue or the predictive keyboard bug changed the letter “I” to “A [? ]” for some users. This bug had been discovered soon after iOS 11.1 was released. The iOS 11.1.1 update doesn’t come with any security fixes and many users were expecting a fix for the battery drain issue reported with iOS11. To download the update, users need to head to their device Settings app and look for Software Update under the General tab. The update us about 50MB in size. Apple had released the iOS 11.1 update for the iPhone, iPad and iPod Touch on November 1. It was a major update which introduced over 70 new emojis to Apple's mobile operating system and brought back the 3D Touch gesture for multitasking. Other additions include improvements to accessibility options and bug fixes to some known issues. Apple reintroduced the 3D Touch multitasking gesture for those using the iPhone 6s or later devices with the iOS 11.1 update. Users can now enter the app switcher by either touching the left edge of the display with pressure or can switch between recent apps by pulling with pressure from the left to right. The gestures work in a different way on the new iPhone X. The company is currently testing the iOS 11.2 update in a beta programme and it will come with a new feature named Apple "Pay Cash". The feature was announced earlier this year and users will be able to send and receive cash inside the Messages app on their iPhones.